Halloween is right around the corner, and that means there is only one thing on everyone’s mind… CANDY!!! While we love it just as much as our patients do, too much sugar can have detrimental effects on your teeth and smile. Sugar-filled Halloween candy that fill up trick-or-treat bags are acidic in nature. Additionally, bacteria in our mouths thrive on these sugars and “eat them” producing acid as a bi-product. This acid, in turn, causes pH levels in our mouth to drop. When the pH drops below 5.5, it is at a critical level and begins to decalcify the enamel of our teeth. What this means is that the sugars in candy actually begin to chemically erode our teeth. Erosion damages the enamel but often we do not see decay (cavities) until the later stages of erosion, when the next layer of the tooth is exposed. This can lure us into the false sense of security that a high sugar diet is not damaging our teeth. Primary, or baby, teeth have thinner enamel than permanent teeth and therefore the erosion can lead to cavities faster in young children than adolescents or adults. So how do we enjoy that delicious candy and keep our teeth healthy and strong? The first and most important tip is MODERATION! Limit yourself to one or two pieces of candy a day and always brush and floss afterwards! Second, make better choices on the specific types of sweets you consume. Here are some helpful tips for Halloween candy and your teeth. Sticky/chewy candies: Sticky or chewy candies, such as Skittles or Laffy Taffy, are not only filled with sugar; they also have a tendency to stick on teeth and continue producing acid until they are mechanically removed by a toothbrush, tongue, or other means. These candies are especially detrimental in children below the ages of 8-9. This is the age that most children develop the sensory awareness to realize they have something stuck in their teeth. Sour candies: Sour candies such as Warheads and Sour Patch Kids are abundant in citric-acid and therefore lower the pH in the mouth faster than other sugars. A lower pH in the mouth makes teeth more susceptible to decay. Chocolate: Everyone loves it! And it is actually one of the better candies as far as decalcification goes. Chocolate will melt off the teeth instead of sticking around for hours after eating. Opt for pure chocolate such as Hershey’s kisses instead of candy bars with sticky ingredients such as caramel or toffee. Gum: Sugar free gum is actually not harmful to teeth and can be a great sweet substitute for candy! Some brands, such as Trident, now include Xylitol. Xylitol has been shown to aid in re-mineralization and prevention of tooth decay. Our last and final helpful tip is to combat decalcification with FLUORIDE! Make sure your toothpaste has either Sodium Fluoride or Stannous Fluoride as an active ingredient. A fluoride rinse such as ACT or Listerine Total Care can also be a great adjunct to your dental homecare routine. Fluoride remineralizes teeth and makes them more resistant to decay. Do you have too much candy at your house? Adams and Cheek Dentistry is participating in the candy buy back program Operation Gratitude. 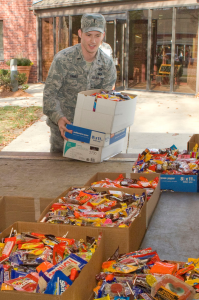 Operation Gratitude gets your left over candy to our troops overseas for a sweet treat! Our office will be collecting candy November 1 through November 8. PreviousPrevious post:Dental Insurance AlternativeNextNext post:Unique Oral Care Tips for National Dental Hygiene Month!